Unlicensed care homes provide room, board and some level of services for two or more unrelated individuals, but are not licensed or certified by the state. These homes often serve very vulnerable individuals such as individuals with serious mental illness or other disabilities, or older adults with functional limitations and limited financial resources. Some of these homes are legally unlicensed while others operate illegally. 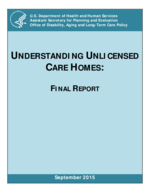 The goal of this exploratory study was to understand how unlicensed care homes function as a residential care option, the types of individuals who reside in them, their characteristics including quality and safety and the policies that influence the supply of and demand for these homes. While exploratory in nature, the findings highlight potential issues of safety, abuse and financial exploitation in unlicensed care homes.